Known to many in Essex County from his family owned and operated "Matarazzo Farms" in West Caldwell, Jim Matarazz has been a fixture at the Montclair Farmers' Market for several years. 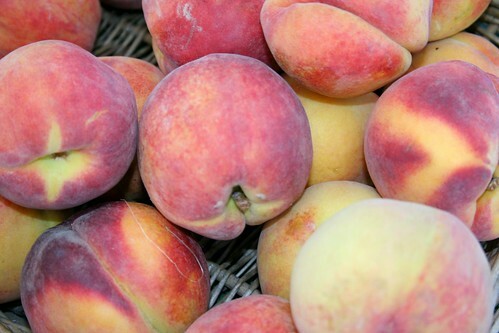 It's peach season in the Garden State and Jim will be sharing his bounty with those in need on Saturday. 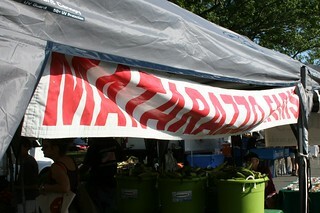 From 8am to 2 pm Matarazzos will give a free quart of Jersey Peaches to anyone who is struggling in this economy. Each Saturday morning the Matarazzos, and several other farmers, bring the locally grown fruits of their labors to the Walnut Street station parking lot. As a foodie I'm all over the farmer's market, as a transplanted Californian I am thrilled to find produce that is not from the San Joaquin Valley and as a resident of NJ I love the idea that the Garden State is more than a slogan but a way of life. I go to the farmers' market on Saturday mornings for the food but also to protect a way of life and use of land that is slipping away. This Saturday I am going to support a farmer who is doing something wonderful for the least among us. If you're in Montclair stop by Matarazzo's on Saturday. If you're having trouble making ends meet know that Jim will be sharing his bounty. If things are working out for you, stop by anyway and just enjoy being in the presence of a true mensch.